Below you can find driving directions from Google Maps to help you get from Oakland Park to your nearest Fix Apple Now store, situated in Hallandale. You can either copy the driving instructions below or click here for a larger map and driving directions. Do you need to mend, repair, replace, restore, fix or reset a broken iPhone 4, 5 or 6, iPad, MacBook Pro, MacBook Air, Apple Mac or iMac in Oakland Park? If so, talk to Fix Apple Now today. We are one of the fastest-growing companies on the market and can provide the high-quality services you've been looking for. We have experience in solving all sorts of problems with Apple devices such as boot loop, crashing apps, incoming call screens not appearing, crackling noise through headphones, cracked and frozen screens and more. You can count on us to get to work on solving your problem quickly so you don't need to live without your beloved device for more than a few days. You can get in touch with us at any point if you have any questions about what we can offer. Though we offer some of the best prices on the market, we never cut corners when it comes to quality. 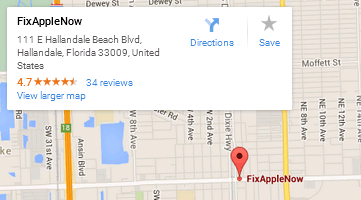 Why not talk to us today if you've been searching for Apple repair services in Oakland Park?